Facing a number of high-profile defections and about as many big holes, the Rangers faced a tough task this winter. Their acquisitions are just talented enough to work out well for them, but they’ll need some luck to approach their 95-win total from 2016. Heading into the winter, the Rangers faced a number of potential high-profile defections, including those of Ian Desmond, Carlos Gomez and Carlos Beltran, and a limited amount of cash with which to address them — the Rangers’ budget was somewhat restricted by high-dollar, low-value contracts such as those of Prince Fielder and Shin-Soo Choo, as well as expensive deals for Cole Hamels, Adrian Beltre, Elvis Andrus and Yu Darvish. In particular, the Rangers needed to replace key players in their outfield, upgrade their rotation and find a solution at first base and/or DH. In their rotation, the Rangers sensibly declined longtime starter Derek Holland’s $11MM option, paying him a $1.5MM buyout after a season in which he posted a 4.95 ERA, 5.6 K/9 and 2.9 BB/9 while struggling with shoulder trouble. They also parted ways with another longtime starter, 37-year-old Colby Lewis, whose 3.71 ERA in 2016 masked lousy peripherals. Lewis remains a free agent. The free-agent market for starting pitchers was poor, giving the Rangers limited opportunities to find another solid starter to complement Hamels, Darvish and Martin Perez. Instead, they gambled on two interesting former Padres arms, Andrew Cashner and Tyson Ross. Both are relatively young pitchers with tantalizing stuff, but they also both come with major question marks. 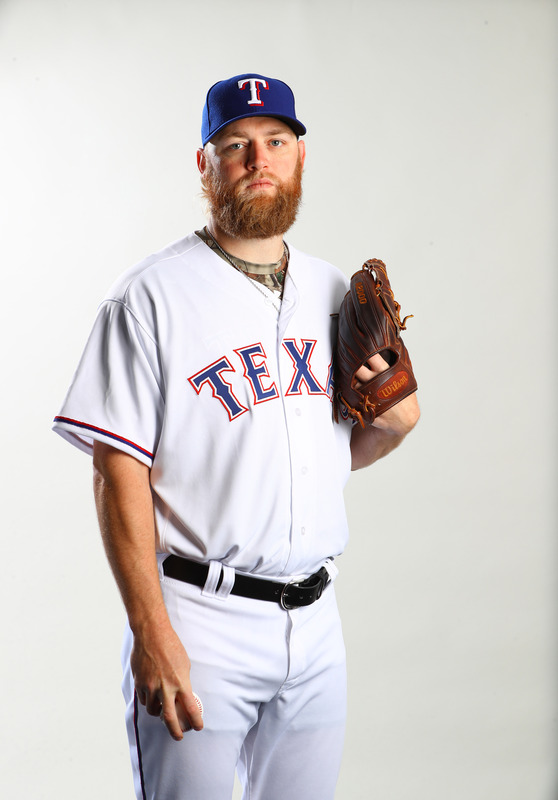 Cashner received $10MM and will enter the Rangers’ rotation as soon as he’s ready, likely sometime late this month. The 30-year-old brings mid-90s heat and a hard slider, but he’s never gotten the sorts of strikeout rates you’d associate with that repertoire, and he’s coming off a season in which he posted a 5.25 ERA, 7.6 K/9 and 4.1 BB/9 while fading down the stretch. It will be up to the Rangers to figure out why. Cashner has used his changeup less and less frequently over the years, and the pitch has been less effective when he’s thrown it; reestablishing that pitch might be a key to reviving his career. As Fangraphs’ Eno Sarris points out, Rangers catcher Jonathan Lucroy might be able to help Cashner with his quality pitch framing. In any case, Cashner’s an interesting gamble, although $10MM seems like a lot to pay given his recent performances. He’ll also begin the season on the DL due to biceps tendinitis. The Rangers also added Tyson Ross, whose main problem is health. The 29-year-old had back-to-back excellent seasons in San Diego in 2014 and 2015, but pitched only one outing in 2016 due to shoulder trouble, and finally had offseason surgery to relieve thoracic outlet syndrome. The Padres non-tendered him in December, and the Rangers lured him away from the Cubs with a $6MM deal. He isn’t ready yet, but he’s progressed to throwing bullpens and simulated games, and could be ready to join the Rangers early in May. It remains to be seen whether the Rangers will be getting the pitcher who struck out a batter an inning and posted ground-ball rates in the 60% range in 2014 and 2015. Ross can help them if he’s even half that good, but it’s difficult at this point to project with any certainty that he will be. The Rangers thus began the season with a rotation that features neither of the key starting pitchers they acquired. Darvish, Hamels, Perez and A.J. Griffin (who struggled to a 5.07 ERA, 8.1 K/9 and 3.5 BB/9 in 2016 after missing two full seasons to injury) will comprise the initial rotation, with Cashner perhaps joining in mid-April when the team needs a fifth starter. The Rangers initially signed Dillon Gee to a minor-league deal, and then, after he opted out, re-signed him to a big-league contract and optioned him to Triple-A; he represents an alternative if Cashner isn’t ready to go. Given the considerable question marks surrounding Cashner, Ross, Griffin and Gee (and, if we want to get really pessimistic, Perez, who posted a very shaky 4.7 K/9 last season), the Rangers’ rotation still looks iffy, although it’s also easy to see the upside if Cashner and Ross pan out. In the outfield, the Rangers lost Desmond to the Rockies, who agreed to pay him $70MM over five years. The Rangers, meanwhile, received the No. 29 pick in this year’s draft as compensation. The Rangers had interest in Desmond, but were wise not to match the Rockies’ offer — Desmond’s resurgence in 2016 was fueled by a career-best .350 BABIP, and he’s already 31. Instead, the Rangers retained another outfielder, re-signing Carlos Gomez to a short-term deal to man center field. Gomez’s career seemed to be falling apart when the Astros released him last August, but he caught on with the Rangers down the stretch and batted .284/.362/.543, numbers worthy of his brilliant 2013-2014 run with Milwaukee. That sort of production probably won’t continue, but for a mere $11.5MM, the Rangers can get a good deal even if Gomez’s offense tails off. His hitting is hard to predict, and his 30.0% strikeout rate for the 2016 season is a bad sign, but he has defensive and baserunning value going for him, plus a bit of home-run power. All things considered, he seems good for about two wins above replacement, which would rather easily make him worth the value of his contract. Napoli is coming off a 34-homer season in Cleveland. The 35-year-old has always fared well in Texas — he had two of the best years of his career there in 2011 and 2012, and also was productive after the Red Sox dealt him to the Rangers in August 2015. It’s not a given his third stint with the team will go as well, given his age and his seemingly limited ability to hit for average. He batted just .248 in 2014, .227 in 2015 and .239 in 2016, and if his ability to make contact declines at all, he might have trouble hitting enough homers to compensate. As with the Gomez deal, though, it’s hard to argue with the limited commitment the Rangers made, coughing up only $11MM guaranteed and getting a 2018 team option in the deal as well. The Rangers also exercised Lucroy’s $5.25MM 2017 option (probably the easiest move they made this winter), and extended backup Robinson Chirinos. Chirinos’ extension bought out his 2018 season, which would have been his last season of arbitration eligibility, for just $2.35MM, likely less than he would have gotten had he been even modestly productive in 2017. The Rangers also received a cheap option for 2019, giving them a couple years of flexibility as they prepare for Lucroy’s possible departure to free agency next winter. Chirinos had never been paid more than $1.55MM in a season prior to the extension, and, at age 32, might never have gotten another shot at a multiyear, multimillion-dollar contract. His new deal thus provides him with a bit of financial security. The Rangers never did acquire another player to help at DH, and it appears they’ll have Choo soak a number of plate appearances there. In a vaccum, that makes sense — Choo has rated as a below-average outfield defender in the past several seasons, and he’s had health problems to boot. With Nomar Mazara slated for the bulk of the time in right, that leaves left field open to one of the most wide-open time shares in baseball. Delino DeShields arguably sits atop the depth chart at left field, which seems like a questionable proposition. DeShields is coming off an outstanding spring in which he posted a .442 OBP, but he’s coming off a miserable 2016 season in which he batted just .209/.275/.313. At just 24, DeShields is young enough to improve, and he’ll certainly make the Rangers’ defense better. But his bat is a question mark. Neither Ryan Rua nor Drew Robinson have established a track record of offensive production at the major league level, but they’ll also factor in the mix. Then, there’s Jurickson Profar, once an elite prospect and now something of a super-utility option. Though there was reported trade interest over the winter, Texas elected to hang onto Profar to see if he can restore some of his lost luster. He will participate in the game of musical chairs in left and might also step into the infield wherever a need arises. Gallo, too, could theoretically shift to the corner outfield in addition to seeing time in the corner infield or at DH, depending upon how the season progresses. For both of these top prospects, it’s something of a make-or-break year for their futures with the Rangers. Then there’s the Rangers’ pitching staff. It’s always hard to know how a bullpen will perform, but the Rangers’ looks fine — their 2016 ’pen didn’t rate well overall, but they’re returning most of the relievers (including Sam Dyson, Matt Bush, Tony Barnette and Alex Claudio) who were key to their second half, when their bullpen did an outstanding job keeping the ball on the ground and were very effective overall. Another key reliever, Jake Diekman, will be out until at least the All-Star Break after having colon surgery. Jeremy Jeffress will need to keep his off-field issues in check to play his expected role; if he can do that and remain effective, then either he or Bush would represent alternatives at the closer role if Dyson’s early struggles continue. They’ll have to get the ball to those pitchers, though, and their rotation looks like it could quickly boil down to Hamels, Darvish and then a bunch of uncertainties, particularly if Cashner and Ross don’t reemerge. 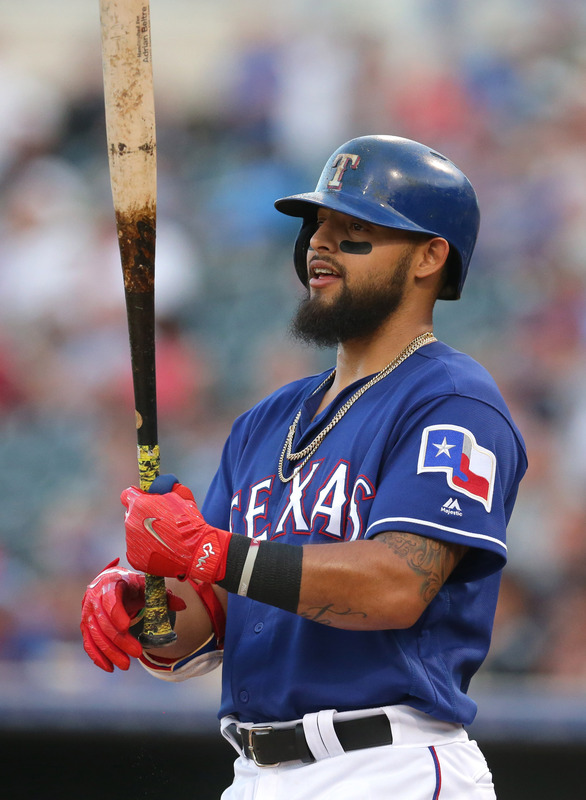 Late in Spring Training, the Rangers announced that they’d signed second baseman Rougned Odor to a six-year, $49.5MM deal with a club option for 2023. The deal buys out what would have been Odor’s first two free agent seasons, with an option for a third. The deal is roughly comparable to recent six-year, one-option extensions for fellow second basemen Jason Kipnis and Matt Carpenter, who received $52.5MM and $52MM, respectively, when they had between two and three years of service time. It’s also interesting to compare Odor’s deal to that of another infielder’s recent extension: that of Jose Ramirez, who received just $26MM over five years and gave up two option years. Even if the Indians exercise Ramirez’s first option, he’ll only receive a total of $35MM, far less than Odor, Kipnis or Carpenter received. It’s debatable whether Odor will be as valuable as Kipnis or Carpenter have proven to be — Odor produced a mere .296 OBP and questionable defensive numbers in 2016. But the outlier here is Ramirez’s contract, not Odor’s, and that ultimately isn’t surprising. Kipnis, Carpenter, Ramirez and Odor were all early enough in their careers at the time of their extensions that many of the yearly salaries their extensions covered would have been governed by the arbitration process, which values counting stats. While Odor doesn’t have the overall track record Kipnis or Carpenter did, his 33-homer total in 2016, if sustained, probably would have gotten him paid at a similar rate. That’s particularly likely since the Kipnis and Carpenter contracts are both now three years old. Ramirez, meanwhile, had two uneven years before his breakout 2016 and hasn’t posted outstanding counting stats in any category. As a player, I’d probably prefer Ramirez to Odor, due to Ramirez’s defense and versatility, as well as the greater likelihood that he’ll continue to reach base at a palatable rate. But it makes sense that Odor was the one who got the big contract. These are, of course, different questions than whether the Rangers should have extended Odor. Odor whiffed seven times as often as he walked in 2016, a worrying sign. He only recently turned 23, though, so there’s plenty of room for growth. And even if his career stagnates, his deal is still fairly cheap in the grand scheme of things despite being considerably more expensive than Ramirez’s, and his positional value, power and age insulate the Rangers somewhat against the possibility that the deal will go south. The Rangers’ 95-win 2016 season was built on shaky ground — they only scored eight more runs than they allowed. This year, their weaknesses look fairly obvious, particularly in their rotation. They have enough marquee talent (including Hamels, Darvish, Beltre, and Lucroy, potentially along with players like Odor or young outfielder Nomar Mazara) to contend if things go well, however. Within that context, their signings of Cashner and Ross this offseason look like Hail Mary passes — those gambles don’t appear incredibly likely to produce huge dividends, but could be decisive for the team if they do. The Rangers might have a hard time topping the Astros this season. But it’s easy to see how they could. If things don’t go as hoped, though, the front office will increasingly face questions about how to handle the next offseason. While the Rangers could revisit extension talks with Darvish and Lucroy, or pursue them on the open market, efforts at new deals fizzled this spring. That could leave two very notable holes on the roster at the end of the 2017 season. Photos courtesy USA Today Sports Images. Like the rest of the series, a good and interesting read. The worst pitching coach in the league is going to “fix” Casher and Ross? Highly doubtful. The Rangers do have another assets, not mentioned; Jon Daniels, hungry ownership and (at long last) a retractable roof stadium on the way. Daniels is not a perfect GM but he’s proven to be smart and creative. Ownership is not going to let a few million dollars stop them from going after any player they feel fits. Free agents, particularly pitchers, avoided Arlington for decades because of the heat & hitter-friendly environment, now changing to air conditioning & likely less outbound winds. Bannister is an ideal mgr for this franchise & works well with Daniels. As currently constructed, there are questions. But Odor, Profar, Mazara, Bush, Gallo, & promising minor league pitchers Mendez & Martin have kept the Rangers from becoming an “old” team. (wait til you see super prospect, OF Leodys Taveras upside) We’ll see about 2017, but there are still many reasons to believe Texas will find a way to remain competitive while attracting more free agents in the future. The Rangers seem to be a team held together by duck tape. So many of their players have question marks. If they get off to a slow start they have so many trade assets that it could make for an interesting trade deadline. Darvish, Lucroy, Napoli, etc… could really help the Rangers restock their minor leagues.